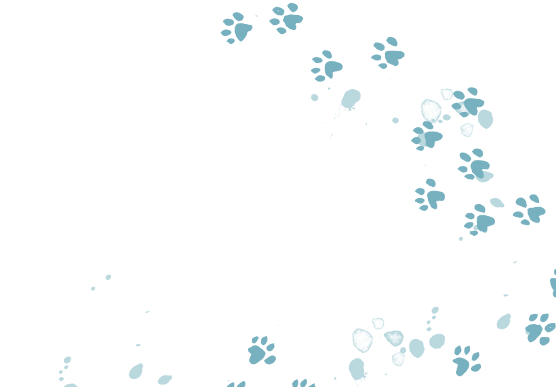 Squishy McFluff » Here comes the sun… Squishy McFluff: Seaside Rescue! out today! Here comes the sun… Squishy McFluff: Seaside Rescue! out today! Pip: Hooray, hooray! It’s publication day! I’m so excited that Squishy McFluff: Seaside Rescue! is out. 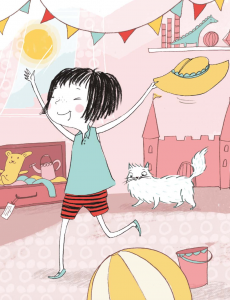 Writing this story reminded me of so many lovely holidays when I was a child – the adventures I had on the beach and (like Ava, but not *quite* so dramatic!) in boats. So, I thought I’d share some memories on the blog – and I am not alone! Ella Okstad is here too. Hi Ella! Pip: So… holibobs! When I was little, we used to go to Wales every summer, to a little coastal village where my Grandma was born. My Dad would build boats in the sand (they were so cool, you could actually get in, and sit in them, and row away… if you used your imagination!) 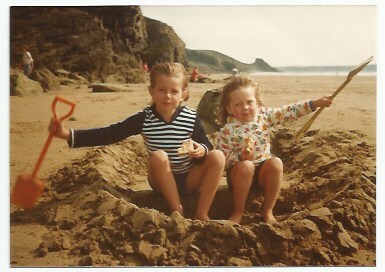 and then my sister and I would sit there eating ham and sand sandwiches (the sandwiches ALWAYS got sand in them). 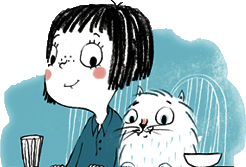 Pip with her big sister (who you’ll meet in Squishy McFluff book 6 as Auntie Tash!) in their sand boat, 1979! Pip: So how come you went to Denmark lots? Ella: My Grandma was Danish. Some of the holidays in Denmark were spent camping, and a couple of times we stayed on a farm where they had pigs. I remember once we drove down to Oslo in my mum’s little green car, and took the boat to Copenhagen. The car had to be hoisted onto the upper deck with a crane! I remember my mum getting hysterical while we watched it floating above us. Pip: Sometimes my Grandad would drive us to Wales – that would be Great Grandad Bill from the Squishy books, who is now 102! It took soooooo long to get there. But I loved the Welsh holidays. 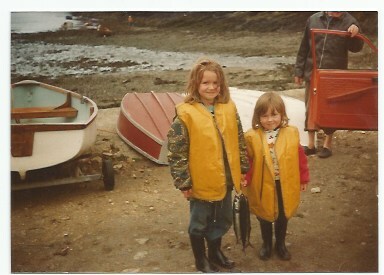 It was always really exciting going out on the boat, fishing for mackerel. It makes me smile when I think of the walks we’d do to the beaches. My Grandma would be striding on ahead, saying ‘come on Bill, hurry up!’ and Grandad would be slowly walking behind, heavily laden with picnic basket, blankets, windbreak, fold up deckchairs etc… poor thing! 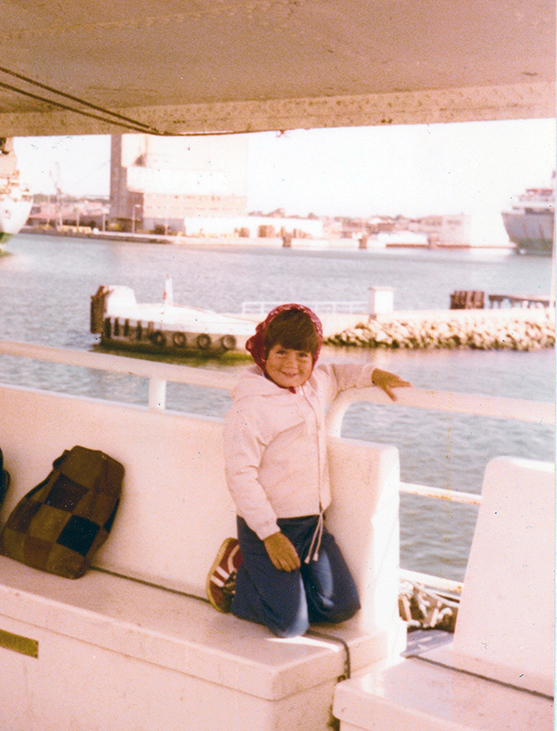 Ella setting off on holiday, aged 5, in 1978! Grandad Bill staggering along with all that stuff! Do tell him I said hello! 🙂 And did you go on holiday abroad when you were little, too? Pip: We did! I was very lucky. Even when I was very young we went to lots of European countries, including France and Spain. My mum liked to make my sister and I learn some of the language of wherever we were going, so she’d buy those ‘Learn to Speak…’ cassette tapes for us to listen to every morning. I couldn’t say a huge amount of it went in, but there were several essential phrases we had to know: ‘Good morning/afternoon/night’, ‘please’, ‘thank you’ and ‘where is the loo?’! Ella: Ha! Yes, Very Important. Pip: One of my funniest holiday memories was in France when my mum was trying to speak French to a local man in a cafe. She was trying to explain to him that the car we drove was a French make – a big Citroen DS. But she wasn’t pronouncing it quite right. She should have been saying ‘Citro-EN’, but she was saying ‘citron’. Poor chap, he was sitting there, totally confused, watching my mum getting more and more frustrated (doing steering wheel hand movements and everything) telling him that she drove a ‘grand citron’ – which actually meant a ‘big lemon’. Ha! Ella: Language misunderstandings are always funny. My mum and I travelled to the Greek islands and Cyprus a few times. We loved it there – coming from the cold north, it was so nice to have a bit of sun and warm weather. Anyway, the first time I went, I was a bit confused, because I constantly heard Greek people shouting ‘Ella, Ella!’. I thought, ‘wow, it’s strange how everyone here knows my name!’ After a while, I learned that they were actually shouting ‘Ela edo!’ to one another, which means ‘come here!’ in Greek. Pip: Oh, we went to Greece as well! We spent a lovely holiday on an island called Spetses, where we met a man called Yanis. He had an amazing house on top of a hill, and he owned seventeen cats. Ella: There’s actually an ancient monastery especially for cats in Cyprus. It’s called the Holy Monastery of St Nicholas of the Cats. We went there once. There were six old nuns, and cats everywhere! Pip: Visible cats? Not like Squishy then. Ella: Ha! I imagine Squishy would love to go on holiday there and get pampered by the nuns. Pip: And they’d always forgive him for being mischievous! Ella: Unlike the ice cream man in the new book, probably. We really hope that you enjoy the new story. Seaside Rescue! has mischief, mayhem and (eek!) a disaster that demands a pretty heroic performance from Ava’s Mum. 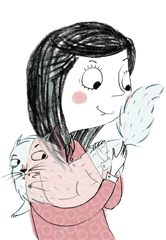 I especially hope that it makes mummies smile – the theme of the book being that a mother’s love knows no bounds. Hooray for mums! We’d love to hear what you think of Squishy McFluff: Seaside Rescue!, so do comment below. In the meantime, enjoy the summer sunshine (I’m sure there WILL be some), and happy holidays one and all. p.s. Click here for a Squishy McFluff: Seaside Rescue! review from The Bookbag.